In November 2015, CGD published a report on the unintended consequences of anti-money laundering policies for poor countries, focusing on three groups: migrant workers who send remittances to their families, vulnerable people who are displaced by conflict or natural disasters and are in need of foreign assistance, and businesses that rely on cross-border trade. Since then, the international community has made several efforts to address the problem of financial exclusion created in part by these policies. Specifically, FSB has worked closely with G-20 members, as well as the IMF, World Bank, and the Financial Action Task Force (FATF)—the global standard setter for AML/CFT regulations—to implement a four-pronged approach aimed at supporting financial access through the correspondent banking system. The work plan consists of (1) improving data collection, (2) clarifying regulatory expectations, (3) supporting capacity building in vulnerable countries, and (4) leveraging technology to facilitate compliance with anti-money laundering and countering the financing of terrorism (AML/CFT) regulations. Two World Bank surveys (“Withdrawal From Correspondent Banking – Where, Why, and What To Do About It” and “Report On The G20 Survey On De-risking Activities In The Remittance Market”) published in November 2015 shed light on the causes and scale of account closures and more recent data gathered by the IMF have largely supported those findings. The data suggest that the withdrawal of correspondent relationships is a global phenomenon but one whose effect has varied greatly by country and region. Small countries have been the hardest hit, particularly those with offshore financial centers, and those where there are perceptions of high AML/CFT risk. Several larger countries have also reported a large number of account closures, including Mexico and the Philippines. On a regional basis, the Caribbean and Pacific Islands appear to be the most affected. Using data from SWIFT, the global provider of secure financial messaging services, more recent analysis by the Committee on Payments and Market Infrastructures (CPMI) indicates that the volume of transactions processed through correspondent bank relationships has increased since 2011, while the number of correspondent relationships has declined over the same period in most regions (see Figures 1 and 2). 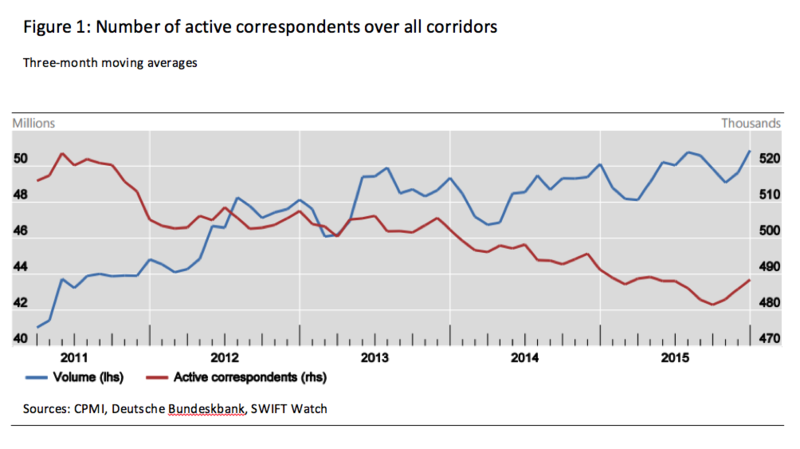 This suggests that interbank flows have become more concentrated, which may have implications for financial stability and market competition. The FSB is now conducting a follow-up survey that will examine the extent of this concentration in specific markets, as well as how account closures have affected specific categories of customers. 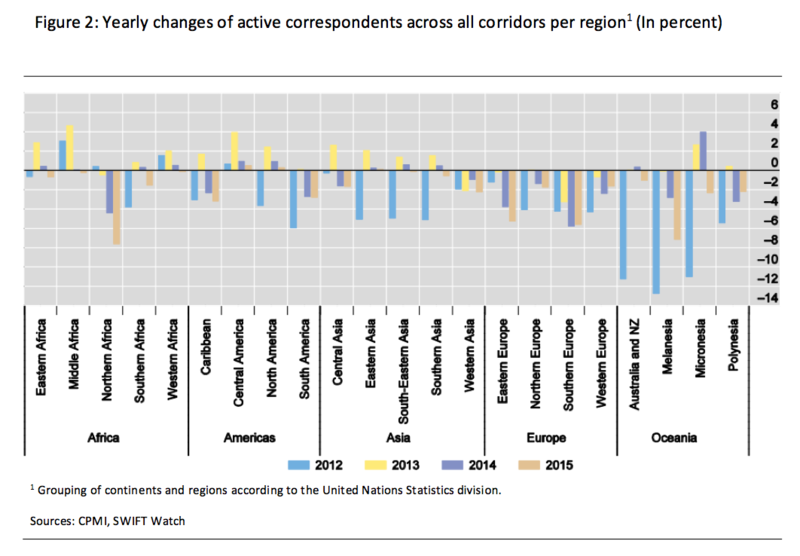 The World Bank data also provide insight on the causes of account closures. Banks continue to cite AML/CFT concerns as the predominant reason for terminating accounts. Specifically, they note the increasing cost of complying with AML/CFT regulations and uncertainty about both supervisors’ expectations for appropriate due diligence and the nature of enforcement actions if they get it wrong. There are other drivers of account closures as well, that have received less attention, including the low interest rate environment and the more rigorous prudential standards put in place following the global financial crisis. Low interest rates compress banks’ profit margins, while higher prudential standards have raised the cost to banks of holding risk on their balance sheets. All these factors have combined to make correspondent banking less profitable and less attractive. We still do not know to what degree account closures have affected financial access and real economic activity. To determine this will require carrying out in-depth qualitative studies in affected countries, as well as developing a framework for systematic data collection that produces time-series data that is comparable across countries. Since 2012, when the FATF completed its shift away from endorsing a rules-based approach to AML/CFT, the risk-based approach has been the foundation of national AML/CFT frameworks. This approach provides flexibility by allowing banks to allocate their resources more effectively and take preventive actions commensurate to the nature of risks that they face. However, it also puts the onus on banks to fully understand the nature of those risks and how to respond appropriately. Given this heightened responsibility, and the relative newness of the approach, it is unsurprising that banks have asked for greater clarity regarding how they should apply it to their client (i.e., “respondent”) banks and money transfer operators (MTOs), since these relationships often require enhanced due diligence. The FATF responded to this request in 2016 by updating its guidance on MTOs and publishing new guidance on correspondent banking services, both of which sought to clarify the responsibility banks have applying the risk based approach in each area. The guidance also tried to disabuse banks of the belief that they are required to conduct CDD on the customers of their respondent banks (a practice often referred to as “know your customer’s customer” or KYCC). The OCC recently provided more proactive guidance, publishing a set of “best practices” that banks can consider following when conducting periodic risk reassessments of their correspondent relationships. If banks lack confidence in a country’s ability to supervise for AML/CFT risks, the hurdle for doing business with financial institutions in that country is significantly higher. For that reason, improving compliance with global AML/CFT in countries vulnerable to financial exclusion is crucial. The challenge for the international community is two-fold: to ensure that sufficient resources are available to meet this demand and to take care that resources are directed to those countries that are truly committed to reform. At the Hangzhou Summit in September 2016, G-20 Leaders called on member countries along with the IMF and World Bank to intensify their support for these efforts. The IMF and World Bank play an important role in this area due to their intimate understanding of global standards, neutrality, and global footprint. While the modalities of their approach to TA differ, both organizations provide a wide variety of services, including helping governments draft AML/CFT legislation, supporting national risk assessments, and training supervisory staff. In the past decade, the IMF has provided TA for AML/CFT to 118 countries, and today has 37 ongoing projects in 29 countries. The World Bank has assisted 54 countries in developing national risk assessments in recent years, with 15 more engagements in the pipeline. Both organizations can do more, including by allocating more of their own administrative resources towards this effort. Currently, both rely heavily on donor-supported trust funds to finance their AML/CFT TA efforts but these trust funds are often limited to supporting work in low-income countries—while financial exclusion also affects middle and upper-middle income countries such as those in the Caribbean. Treasury’s Office of Technical Assistance (OTA) is another important provider of TA. OTA currently oversees 30 projects focused on AML/CFT and prudential bank supervision, and is proactively assessing requests for assistance from a number of affected countries. Over the last several months, OTA agreed to new projects in Belize and Somalia. Technological innovation has helped expand the scope of financial inclusion by allowing the financial sector to reach more people at lower cost. Over time, it will also help banks reduce the cost of complying with AML/CFT requirements. To date, however, the work of the international community—including the FSB—on the role of technology in addressing financial exclusion has focused more on relatively narrow technical measures—like promoting greater use of the legal entity identifier (LEI) and improving the information included in banks’ payment messages—than it has on potentially disruptive and “game-changing” technologies like blockchain and cryptocurrencies. This reflects, in part, the natural lag between technological innovation and regulation. While international regulatory bodies, including CPMI and the FATF, have already published initial analysis and guidance regarding the role of virtual currencies, policymakers are still coming to terms with the benefits and risks associated with these new technologies and, until they do, they are unlikely to endorse specific approaches. As we’ve noted before, the distributed ledger technology that underlies many cryptocurrencies has the potential to make cross-border transactions faster, more secure, and more transparent. But it can also make it harder to detect money laundering or terrorist financing, depending on how a distributed ledger platform is designed. The challenge for regulators is to create a regulatory environment that protects the integrity of the financial system without stifling potentially transformative innovation. One private sector-led initiative that holds great promise is the development of know-your-customer (KYC) utilities. Such utilities could reduce paperwork and improve the accuracy and consistency of KYC information by storing customer due diligence information in a single repository that can be accessed by client banks. Several private entities, including SWIFT, have already developed, or are developing, KYC utilities. At a recent IMF event on solutions to the withdrawal of correspondent banking relationships, a private sector participant estimated that broad use of the SWIFT KYC utility could reduce banks’ compliance costs by as much as 30 percent.